If you’re rushing around in the mornings, it’s even more important to ensure you’re having a nourishing, wholesome breakfast. While these little cookies won’t fill your belly up completely, they contain everything you need to get you out of the door and on to where you’re heading first, all packed in to a delicious bundle of vegan goodness. They’re also great to have handy for a post-exercise blast of protein to help in re-building, maintaining and developing lean muscle. Pair one of these with a green smoothie of banana, apple, spinach and blueberries, and you’re set until lunch time! 8 Tbsp oats, either normal oats or gluten free if they’re available to you. Consuming the carbohydrates from oats helps the body to more readily absorb the protein in these cookies. *Optional 2 tbsp raw pea-protein powder. If this isn’t available, don’t use whey or soy powder, instead opt for my all time favourite – hemp seeds! Still full of protein. *Optional 1 tbsp inspiral’s vitality mix (consisting of maca, acai, baobab, siberian ginseng, reishi & purple corn). This gives the cookies that little extra boost to kick start your morning. Place the oats and dates in to a blender, and pulse until well combined – almost creating a flour-like consistency. Pulse again until everything is combined. *You’ll probably need to keep stopping to scrape the sides of the blender. Use a rubber spatula if you own one so as not to damage the blades of the blender! Add the raw almond butter and coconut oil and pulse again. This will make the mixture a little softer, but if it needs more liquid then this is where you add a little water at a time until a sticky mixture forms. When you’ve blended your ingredients so they form a sticky dough-like consistency, take the mixture out of the blender and place on to a plate or chopping board. Roll the mixture in your hands, making sure it forms a dense ball of mixture. Again this is a little like rolling dough in your hands before you make bread or pizza if you’re familiar with that. Place the mixture on to the plate or chopping board, and flatten with your hands (or by rolling a rolling pin over it very lightly). The thickness you roll the ‘dough’ out to is entirely up to you, but be aware that if this cookie if your breakfast, you’re probably going to want to make it pretty thick to satisfy those morning hunger pangs! Cut your desired size with the top of a jar, or use whatever cookie cutters you may have. 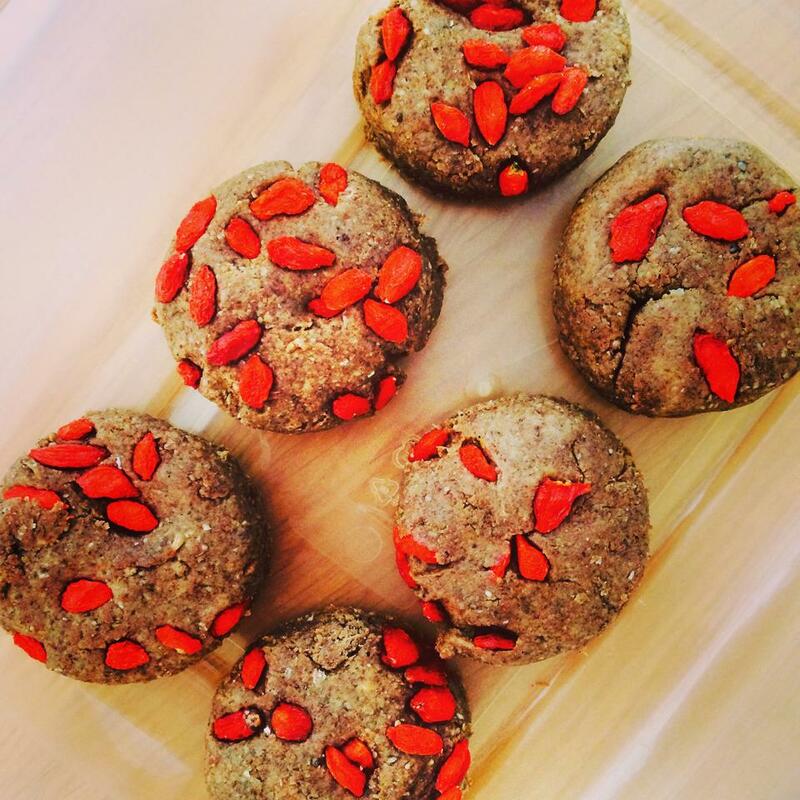 Sprinkle your gogi berries over the top of each cookie, and lightly press them in to the mixture. Place in the fridge to set for a few hours, and then they’re ready for the next time you’re in need of an on-the-go breakfast or post-exercise protein punch. If you’re looking for more healthy snack, breakfast, dinner, lunch or desert recipes, leave a message and I’ll create some ideas!